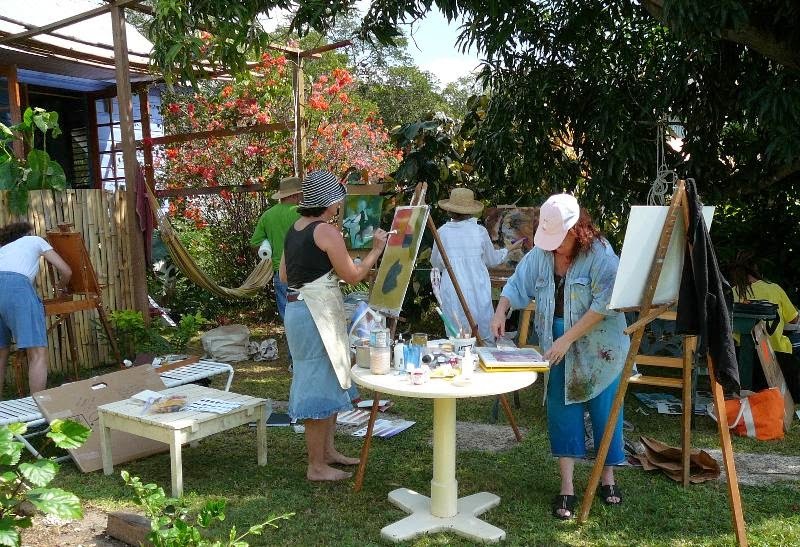 This is Bert and me in Jamaica taking a painting class taught by Alan Soffer. Alan is an amazing painter working in Encaustics (wax medium). My art degree is in Applied Design with an emphasis in metal and fiber. After college, I gravitated to collage and mixed media. I never officially took a painting class. So, with a bit of anxiety, I agreed to take one with Roberta. Now, she didn't have to twist my arm. Jamaica was awesome. And, I love taking a risk and seeing what comes from stepping outside of my comfort zone. Once I became the 'fool' and said yes, I relaxed and went with an open mind. And, to just have fun! We had a great time and I learned some new techniques and to be free with the paint brush.